With all the reviews raving about their highlighters being "amazing", "unbelievable", "pure perfection" and "the best highlighter in the market" (one even claimed that she "basically died of joy" and another said she "would die without this now"), it's safe to say that BECCA — besides Kylie Cosmetics, of course — has been the most hyped beauty brand since they hit the market with their breakthrough Shimmering Skin Perfectors. But just like any other savvy shopper, my skepticism stemmed from a number of reasons: (1) I was positive that I could live and carry on without a BECCA highlighter (I previously use shimmery champagne eye shadow to do my highlights); (2) the price tag was pretty hefty, let's be honest; (3) there were so many options, I didn't know which ones to pick — pressed, poured or liquid? Opal, Rose Gold or Moonstone? ; (4) I figured most of the talked-about products are wayyy over-hyped and overrated. So, as BECCA Cosmetics launches in the Middle East, I put their bestselling and top-rated products to test to answer many of the skeptical shoppers' question: Do they live up to the hype? BECCA Cosmetics is now available in all Sephora stores around the Middle East. The idea of color correcting isn't new. And while its promises are surely tempting, it took me a while to warm up to this technique because a.) it looked frigging intimidating and b.) I didn't want to waste money on the wrong products. 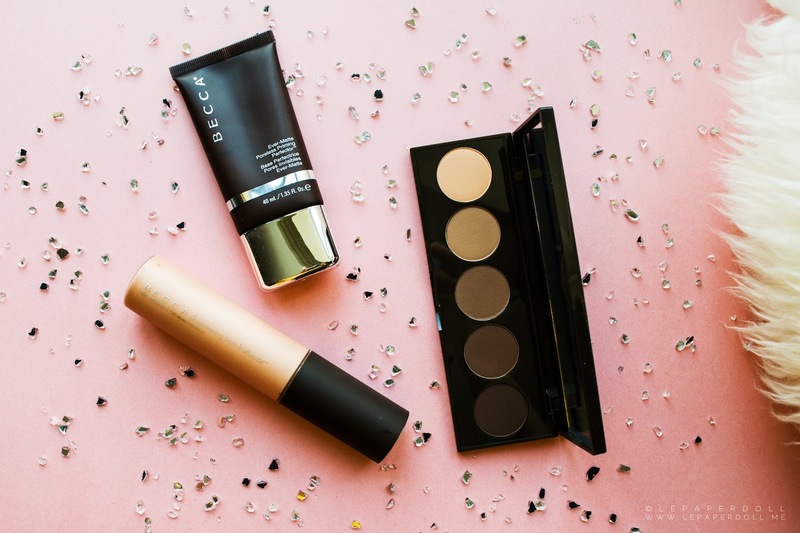 BECCA's Backlight Targeted Colour Correctors are quite a game-changer to my makeup routine. What works better than the color correctors is the Under Eye Brightening Corrector, which can instantly brighten up my eyes and blur out my dark circles without literally pouring the whole tube of product under my eyes. This comes in four distinctive colors designed to target specific imperfections: Pistachio (for redness - not pictured above), Violet (for dull and sallow skin), Papaya (for purple-blue dark circles, i.e. under eyes and tattoos) and Peach, the one I use the most (for brown spots, i.e. pimple marks and hyper-pigmentation). Each of these comes in a glass pot, in high pigment and emollient formula that dries down on the skin to a satin finish. The colors show up boldly with just a quick dab of the product. This is nothing to worry about though, as under eye and color correctors are meant to be applied under the concealer and/or foundation. Apply BECCA Backlight Targeted Colour Corrector(s) and Under Eye Brightening Corrector with a small concealer brush, leave to dry a bit for 1 minute and then blend out the edges properly. Proceed to applying foundation like how you normally do. If the correctors are still visible, layer on a dab of concealer. If these three layers are not enough, you're doing it wrong and you'll end up with a cake face. skin perfectors — prime. contour. highlight. 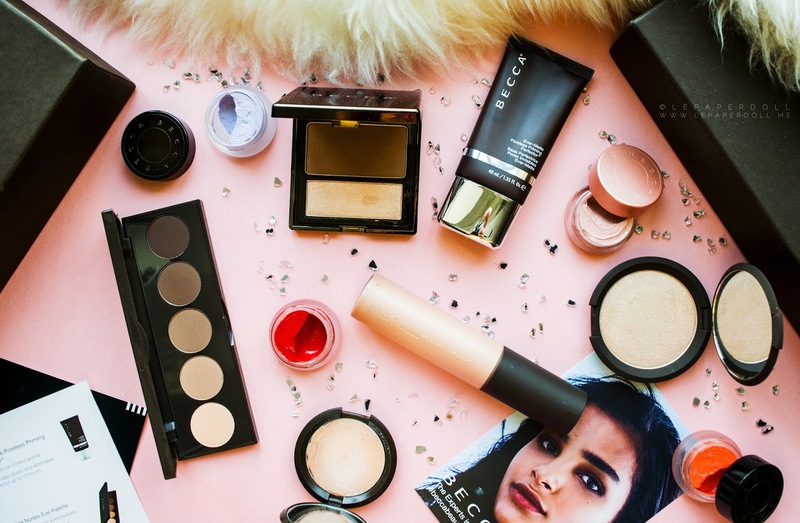 BECCA features a huge array of fab products, but it was their highlighters a.k.a. 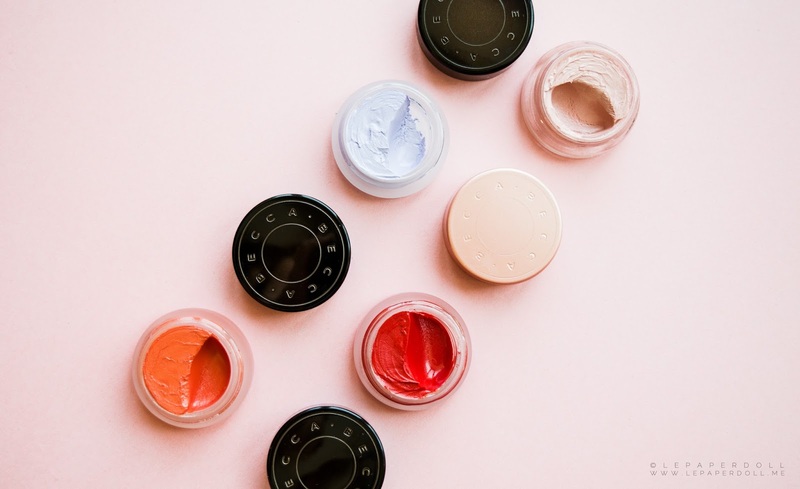 Shimmering Skin Perfectors that brought them major hype and made them beauty industry authority — so those are the ones I'm going to talk about now as I myself cannot wait to rave about them. BECCA Shimmering Skin Perfectors are available in three forms: liquid, poured cream, and pressed powder. One will not be able to tell which one is the best as each formula has their own distinctive features and one's preference should depend on two things: a.) what kind of "glow" you'd like to go for and b.) what type of skin you have. The LIQUID skin perfector is BECCA's original iconic highlighter. It has a thin, almost water-like consistency that can be easily spread throughout the skin even over blemishes or dry patches. While it can be used for targeted highlighting, it is best used when mixed with foundation or tinted moisturizer. I also like it when applied after mattifying primer and before foundation. It is best for anyone who likes a natural dewy finish without shimmer or just an overall luminosity. The skin perfector in POURED CREAM is my personal favorite. It gives a stronger sheen than the liquid version and has a matte, almost opaque color that looks natural nonetheless when used properly in the proper areas. I'm on the oilier side and usually don't dig the Edward Cullen kind of shimmer especially by day, so this works best for me. Finally, the PRESSED POWDER skin perfector is ideal at night or whenever you want to go for a total glam look. Among the three, it gives the strongest sheen and the most visible shimmer. Apply it with the least dense brush you have (some use a fan brush; I use the Sigma duo-fibre F15 brush) to achieve just the right amount of sheen. Friendly advice: this product is buildable, but don't go overboard with it because hardly anyone can rock a metallic-looking sheen. When deciding which BECCA highlighter to buy, the next question would be - which shade: Pearl, Moonstone, Opal, Rose Gold, or Topaz? And this is a tricky one because when you go to see the range of shades, you will want to buy all of them. But basically, the Shimmering Skin Perfector in Pearl is best for fair complexion; Rose Gold and Topaz for deeper, olive skin hues; and Moonstone and Opal would be the best choice for beginners and the indecisive ones as these two would work for any skin tone. BECCA products, most prominently their highlighters, have now become a cult favorite. 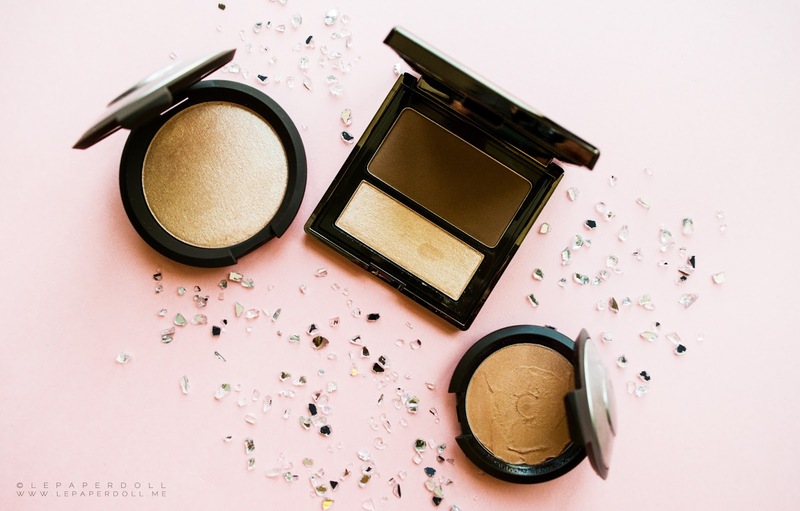 While I do not find them "to die for" as many have testified and I'm sure dupes aplenty are available in the market, BECCA products are undeniably of the finest quality and their highly acclaimed highlighters do live up to expectations. Discalimer: Le Paper Doll received BECCA products as a gift. All photos and views expressed are mine alone... as usual.